Hello Theresa May, I’m an avid follower of your Facebook page. On Friday you posted, “We will deliver on the will of the British people..” That’s great news. Just last year you advised the British people to vote for Remain, which you said would be in the best interests of the country. Couldn’t agree more. Unfortunately, by a slim whisker, ‘the people’ rejected your sage advice and voted instead for Leave. Being pragmatic, you decided to change your advice and follow ‘the will of the people’. If the people want Brexit, you said, that’s what you’d deliver. I understand. It got you by during a difficult time. After all, ‘the people’ only had a choice of providing one-word in answer to that difficult question of whether Britain should stay in the EU. Many weren’t sure which word to choose, ‘Remain’ or ‘Leave’. Many didn’t vote for either word because they were so unsure. Others would like to have voted for one word or the other but were denied the chance. You voted for ‘Remain’. A sensible choice I think. But slightly more people voted for ‘Leave’. But there was no manifesto for Leave. Nothing in your Tory manifesto - only that your party wanted the UK to stay in the EU and to expand the Single Market. There was no clear explanation during the referendum as to what the word ‘Leave’ meant. Boris went on a bus to tell the country that Leave meant the NHS getting an extra £350 million a week. Recently the Vote Leave campaign director said that promise alone clinched the win for them. Frankly, I’m not surprised. Who wouldn’t want an extra £350 million a week for our cash-starved NHS? But now we know that promise can’t be delivered. Leaving the EU is going to cost us an enormous fortune. It’s likely the NHS will get less money. Many of those voting for that word Leave said it was because we have too many EU migrants here, taking our jobs, making our country poorer, and causing too much pressure on hospitals and schools. But last week you wrote an open letter to all those EU migrants – over 3 million of them – saying the country would be poorer without them, and you wanted them to stay. During the referendum, prominent Brexiters said we could leave the EU and stay in the Single Market. Just like Norway, which isn’t an EU member, but enjoys the benefits of EU membership by being in the Single Market. You now say that can’t happen. Leave means Leave. But Theresa, we really didn’t know that before. The word Leave was never properly defined or agreed. We were only given the opportunity to choose Leave or Remain. We’ve never been given an opportunity to choose what Leave would mean. But now we do have a much clearer idea about the Brexit you’re going to deliver to the country. It seems very hard, Theresa. You’re deciding for us what Brexit means, and it doesn’t look as attractive as the one we were told about last year. We now know that after Brexit, trade with our most important customers and suppliers on the mainland of our continent will be costlier and more complicated. Our cost of living will go up. Many companies are planning to move to another EU country and jobs here will be lost. Many EU migrants have left already, and many have decided not to come. Around 10,000 key EU staff working in our NHS have gone, and it won’t be easy to replace them. Unpicked food is rotting on our fields because farmers can’t attract EU labour here any more. And Brexit hasn’t even happened yet. We don’t even know if you’ll get any deal with the EU that’s worth having. But we do know for sure now that the deal you’ll get can’t be anywhere near as good as the one we we’ve got, as an EU member. So, here’s the thing Theresa. The country is changing its mind. You said, ‘Brexit means Brexit’. But now we know what Brexit means, we don’t want it. The latest opinion polls are increasingly showing that Brexit is no longer ‘the will of the people’. According to a new opinion poll by BMG published today, most Britons now back Remain over Leave by ten points. It’s the biggest lead for Remain since the referendum. And according to other recent polls, almost twice as many think we’ll be worse off after Brexit than better off. Similarly, nearly twice as many think Brexit will be bad for jobs as those who think it’ll be good for jobs. In fact, more and more of us think that the UK’s standard of living is going to drop because of Brexit. Polling by YouGov since June’s General Election shows that the majority in Britain now thinks the Brexit vote was wrong. You must be delighted, Theresa. The country is coming around to your original advice. Brexit is the wrong decision for Britain. You said so last year, and now the country is agreeing with you at last. 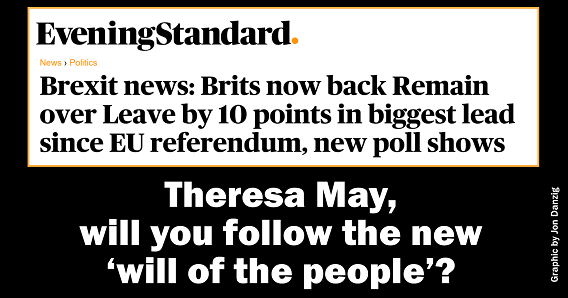 So, Mrs May, will you now follow and deliver on the new ‘will of the people’? I know you will. After all, you’ve always promised to follow the ‘will of the people’. It might be best to put it to a vote, just to make it official. But you and I already know what the result will be, don’t we? The country doesn’t want Brexit, just as you said we shouldn’t.